If you are looking for a grating or flooring material that is durable and safe, look no further. Molded fiberglass grating is chemical resistant, strong, lightweight and non-sparking. 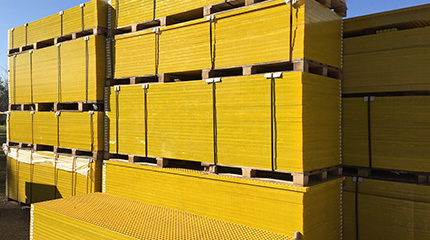 Marco Specialty Steel has a large inventory of Molded Fiberglass Grating, in stock and ready to ship today! Call us today to order Molded FRP or Pultruded FRP, both of which can be ordered in phenolic. Phenolic (Type P): The best choice for applications requiring maximum fire resistance and low smoke emissions such as oil refineries, ships and train decks. Vinyl Ester (Type V): Developed to withstand the harsh chemical environments found in chemical, waste treatment and metal plating plants. Isophthalic Polyester (Type 1): A good choice for environments where chemical splashes and spills are a common occurrence. Food Grade Isophthalic Polyester (Type F): Ideally suited for food and beverage industry environments that are exposed to harsh cleaning chemicals. General Purpose Ortho Polyester (Type O): Cost-effective alternative to vinyl ester and isophthalic polyester products. Meniscus Top: The concave surface, or half-moon cross section has no grit. 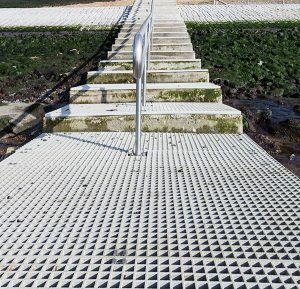 This molded meniscus top grating provides superior slip resistant footing in most environments including wet or oily conditions and is the standard surface for all Marco Specialty Steel’s molded gratings. Integrally Applied Grit Top: The optional grip top molded FRP grating has a quartz grit which is integrally applied, cured and sealed onto the surface providing excellent slip resistant footing. At Marco Specialty Steel, we carry a wide range of FRP products and systems designed to give you maximum choice. In the case of our reinforced grating, we offer two major product lines: molded grating and pultruded grating. Each manufacturing method has its own advantages and results in products with their own mix of performance and durability advantages. If you’re hesitating between molded versus pultruded grating, our experienced team can help you make that decision by highlighting the benefits of each. We produce molded FRP grating in many practical standard dimensions, including 12”, 24”, 36” and 48” widths in a variety of lengths that can be used as-is or cut down to your requirements. Strength: Interwoven square mesh construction offers bi-directional strength. This construction allows for increased loading versatility when compared to rectangular mesh. The uniform placement of the continuous glass strands during construction provides superior strength. Corrosion resistance: Molded grating should be the product of choice for severe corrosive environments. The one-piece fabrication and complete resin coverage adds to the natural chemical resistance of the materials used in our molded fiberglass grating. You also get excellent resistance to moisture, humidity and bacterial growth for food and medical-related facilities. Fabrication features: In areas that require circular cuts or areas to be field cut and fabricated, molded square mesh offers great versatility and will often eliminate the need for additional support for cut edges. Another feature is its easy adaptability to evaluated floor systems through use of special leg pedestals. The pedestal flooring system helps compensate for an uneven sub-floor or slope. Cost Effective: When weighing options for grating materials, molded FRP is a great choice in the long run. There is less waste when installing due to its interwoven square mesh construction. It is also long-lasting and is low maintenance. 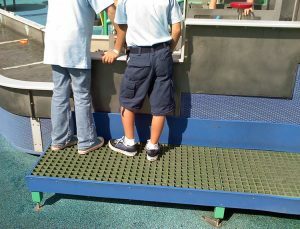 Safety surface: Molded Grating offers an outstanding skid resistant concave surface as an option. A molded-in grit surface is also available to provide sure footing for worker safety, yet its non-porous qualities help eliminate bacterial breeding areas in food applications. Marco Specialty Steel supplies various types of clips for its gratings. We offer specially designed attachments and clips that both fasten panels together and secure them to support structures. All clips are made of type 316 Stainless Steel and are available in 1”, 1-1/2” and 2” sizes. Call us today to find the perfect clip for your molded grating project. Safety precautions: When cutting Molded grating, always wear safety goggles to protect your eyes and a dust mask to reduce dust inhalation. Also wear gloves and a shop coat with neck and sleeves taped to prevent skin irritation. Work in a well-lighted and ventilated area. Cutting molded grating: Depending on the amount (linear feet) of grating to be cut, a variety of shop tools can be used. For best results, use a heavy-duty rotary saw with a masonry, carbide or diamond coated blade. Firm support of the panels will prevent shifting. Turning the panel bottom-side-up gives a smooth surface for the saw to ride on and reduces chipping. Be sure to allow for the blade kerf (3/16″) when measuring. Grinding: All cut edges should be ground smooth. Use a coarse grit, open coated (resin) grinding disk. 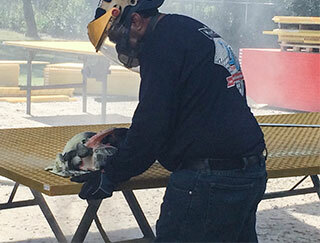 Finishing: All cut surfaces should be coated with resin to prevent corrosion of glass fibers. A light coating of two-part resin system or urethane spray paint is satisfactory. Installation: Provide for a minimum of 1-1/2″ support around all panel edges. Use type “M” stainless steel (type 316) clips every 48″ (maximum) for full 4′ x 12′ panels, a minimum of four clips for any piece. Molded grating is used in many applications for many industries. This grating is perfect for foot traffic and sometimes small vehicles. Molded fiberglass grating is manufactured in a one piece construction process by interlacing pre-wetted glass reinforcing strands in a liquid resin matrix within a given configuration. Once the resin matrix has cured, the molded grid is removed from the mold. The one piece construction insures that all glass is impregnated with resin. Contact one of our sales representatives today to inquire about a quote from Marco Specialty Steel, Inc. Discover for yourself why so many companies just like yours choose Marco Specialty Steel for molded FRP products. 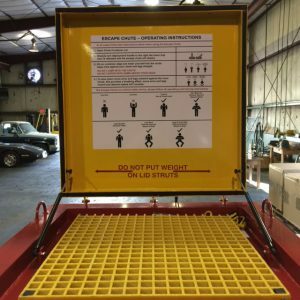 If you require custom-molded FRP grating, we can also create unique solutions according to your drawings and blueprints. Contact us for more information about our products and services and get a no-obligation project quote today.